New Moon Eclipse and I met after both of us had been in the Fancy long enough to have "paid our dues." Having been sidelined as an exhibitor by the birth of a son, I had not been privileged to know "Clipper" as a campaigner. It would have added a dimension to our acquaintance that I regret missing. Nonetheless, I remember our first meeting. 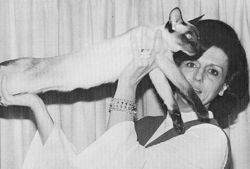 Betty Crotzer, with whom Eclipse lived at the time, was actively showing our cat, GRC Angkor Rose Dixie Daydream, and I flew to Dallas to spend the weekend and attend the Lone Star Show. I walked in the house - it was my first visit - wall-to-wall Grand Champion females that took one's breath away. I had seen them over the years one or two at a time, but never en masse. I was accompanied on my tour of the premises by a friendly sealpoint who either rubbed against my legs or jumped in my lap when I sat. "But where," I asked Betty, "is Clipper?" "Are you serious? ", she asked. - And then we both looked at the boy on my lap. "This," I said, "is GRC New Moon Eclipse of Rogers Hts.?" That was Clipper, the least typical stud male one is likely to encounter. To this day I wonder at the sheer ordinariness of the events that change the shape of destiny - whether it be the course of human history or the evolution of pedigreed cats. Of the "watershed" events, how many of them actually seemed momentous at the time they occurred?" We see many outstanding cats come and go over the years, but the watershed individuals - almost always male because of the biological imperative a male exerts over large numbers of any breed - must be viewed in retrospect. Such a male was Clipper, and how he became so important to the Siamese Fancy is singular. Bit I digress. A few years previous to our first meeting, I had felt the impact of this Siamese male. I decided to declare a holiday, and drove to El Paso to attend an early spring show. I took two girls, a chocolatepoint and a bluepoint. The show was a good one; Betty Crotzer was there with lovely adults. I decided to watch the kittens being judged and two sealpoint Siamese females literally stopped the world for me. My husband asked, as I walked in the front door from the show, "Well?" My answer will have a familiar ring to Siamese breeders who still remember showing against Clipper kids. "Back to the drawing board!" 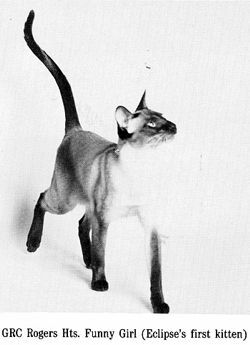 Sin-Chiang's Kali and Sin-Chiang's Riikola were not just an improvement over previous Siamese kittens - they were quantum leaps in type. Showing Siamese in the GSR during the years Clipper lived with Betty was a challenge, and an exercise in courage. He raised our sights, made us strive for an excellence that we might not have achieved had he not cast his shadow. 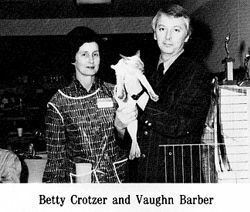 I suppose my favorite Betty Crotzer story has to do with the inevitable pedigree questions with which she was bombarded. She usually replied with a degree of impatience. "What do I need to know of pedigrees? ", she would say. "I just breed everything to Clipper!" The fact was that she selected certain types of females and would go to great lengths to find them. As she once said, "The girls need to have refined boning. Clipper does the rest." Her combinations invariably produced the elegance which was the hallmark of Clipper progeny. There are other catteries that owe their success to this male. It was this elegance, not so much head type as boning, balance and overall refinement that captured the hearts of breeders and judges. The expression in the eyes was also a direct gift of their sire, so much so that one wondered how this particular feature could be so uniformly prepotent. It is said that Willa never fails to recognize Clipper progeny. She sees Eclipse in their eyes. But what of Willa, Clipper's owner and that other person in his life? How did she figure in all this? Her account of Eclipse follows, but this breeder would like to offer a few footnotes to her story. It has been said that one either has an eye for cats, or one does not. Seldom has an individual managed to influence a breed in so significant a fashion. 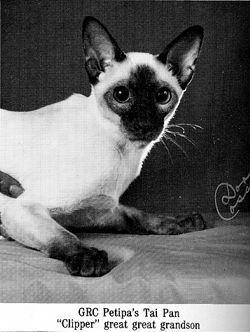 Ask an old-timer to recall a Siamese from the 60's, and you are bound to hear one name among all the others - MaKhanDa Willa. More than a decade later the lady for whom that exceptional sealpoint was named acquired an extraordinary sealpoint male under extraordinary circumstances. New Moon Eclipse is in our record books because of Willa and Betty. One felt compelled to acquire him as much to share him as to own him herself. The other recognized the possibilities with her own growing cattery of fine females and was one of the most avid Siamese breeder-exhibitors of our time. With that combination plus Eclipse himself, The Siamese Fancy couldn't miss! It was "cat show weekend", February, 1971, in Cincinnati, Ohio, a cold, snowy, blustery, typical winter day in the Midwest. The show had been slow, but I had managed to complete my Saturday schedule early, and being the impatient sort that I was in those days, had convinced the show committee to allow me to go into Sunday's schedule. As might be expected, I took longer than anticipated and before long everyone was waiting for me to finish. The judging had been progressing along at a rather sharp clip, but when turning to the Siamese kittens - I nearly fainted. There sat the most spectacular 6-month-old sealpoint Siamese male kitten I had ever seen. His head was so perfect in appearance that it seemed to have been sculptured. His color was faultless and his body and coat equally good. He simply "eclipsed" my imagination. My "BEST KITTEN." During that period, Cincinnati's judging rings were unique in that the judge was enclosed in the center of a horseshoe-shaped arrangement of continual double door cages containing only one break where the judge's bench was placed. The clerk sat inside the enclosure with the judge and kept the records. The audience was outside and never approached the judge in any way. At any rate, probably considering the weather plus the late hour, my kitten winners were picked up rather quickly and when I turned my gorgeous Best Kitten was gone - vanished without a word. The show committee and other judges were getting impatient, so I rather meekly went along to the motel. But, my mind was not on dinner, it was completely mesmerized by that kitten. 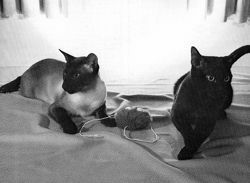 I should explain that I had not owned a Siamese in several years, as my time and energy had been spent on family, career, Burmese cats, and my judging assignments. However, I felt that the Siamese breed was in a decline not only in quantity but quality. During that night I became completely convinced that that special kitten could be the salvation of the Siamese breed and it was surely my duty to buy him and start the "crusade." On Sunday morning my first action was to call for the owner. Her name was Mrs. Owen (Georgia) Headley, a charming, rather reserved young woman. Mrs. Headley was a breeder of fine reputation. She apologized for not thanking me for the win, and also stated that due to the weather, she had not planned to return to the show on Sunday. However, she wanted to sell some kittens and since I had made the male Best Kitten she had decided chances were improved for making a sale. QUICKLY, I asked, "Ooh is HE for sale? How much do you want for him?" She rather apologetically quoted an asking price. I said, "Oh, I think I would like to buy him." The show manager picked that instant to say, "Get started!" After about an hour Mrs. Headley summoned my clerk. She looked rather upset. It seems that now there were three others in a "bidding" contest trying to buy this kitten. She wanted to know if I was serious about wanting him. I had a cat in my hand, but stopped everything. I deposited the cat, got my checkbook, and wrote the check right in the middle of the Tabby Persian Class. During lunch break, Stan Barnaby, one of the officiating judges, remarked, "WOW, did I have a super sealpoint male kitten. I just made him Best Kitten!" I answered, "Good for you; I just bought him!" 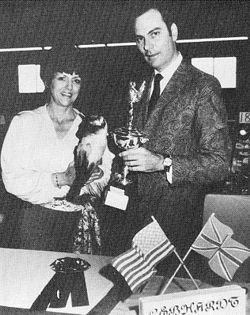 Harriet Wolfgang, my mentor, and a Siamese breeder of fine reputation, was also judging. I could hardly wait for her to see him. She was as breathless over him. "What are you going to name him? Names are very important, you know." I answered, "He is already named; his name is New Moon Eclipse." I thought he was named in the astrological sense; however, Mr. Headley was a jockey of some renown and those of you that are familiar with thoroughbreds know that Eclipse was one of the finest horses in history. My little Eclipse was destined to become to the Siamese what the equine Eclipse was to the racing world. During the trip to the airport, Eclipse was completely nonchalant, reclining in his carrier and behaving as though he had known me all his life. I soon learned that this attitude was status quo for this fellow. Harriet and Edna Field, began to chat about the kitten, both exclaiming that they did not have him in their Finals. We checked the catalog and, indeed, he had been absent in two rings. I later learned that Mrs. Headley had not arrived at the showroom early enough either day to show him in the first ring. Originally, the kittens had been scheduled for 3 judgings on Sunday. Only because I had been able to go into Sunday's schedule on Saturday was I able to judge him. This information certainly helped to reinforce my belief that Eclipse was meant to be mine. When Eclipse wand I arrived in Oklahoma City, I was a bit apprehensive about taking in another new kitty, but Eclipse simply stepped out of his carrier, looked around and back at me as much as to say, "This is it? Where do we sleep? More important, when do we eat?" That cat and I were kindred souls. Eclipse was shown in one more show as a kitten. He did very well; 3 times Best Kitten, but once 2nd Best of Color. He championed in one show and was Bill Eisenman's Best Novice and Best Cat, two other Best Novice wins. He granded in his second show. I was on my way to "campaigning," except I soon learned that I really did not enjoy that type of exhibiting. With a lot of help and considerable pressure from my friends, Eclipse managed to get to 20 shows. The final month we went three weeks in a row, and that is the most consecutive cat shows I have ever attended. Next to the last show of the season was back East. Donna Jean Thompson shared a room with Eclipse, Tricia (his new companion), and me. That was the first time Eclipse had ever bred, but I guess it seemed a likely time - to show off for Donna Jean and her cats. Eclipse was not a particularly aggressive male, but was so sweet and so beautiful that the girls were always soon available to him. Following the Philadelphia show, my friends Roger and Phyl Sanftner, former Burmese breeders, took my cats and me to their home in New Jersey. On Monday we visited the CFA Central Office. The cats had a wonderful time inspecting and visiting with Jean Rose. (Tommy Dent was then a new employee.) As we prepared to leave, Jean asked, "Willa, where do you think he will end up?" I had never even thought of counting his points - really didn't have a clue as to how to do it. I knew Joan O'Hara's black Persian was going to be Cat of the Year, and Viking, Diana Seidel-Doernberg's Russian Blue was doing well. Frodo had been a big winner early in the season, and there was an Abyssinian that had died suddenly but had put together quite a record. Each of those cats had attended more shows than Eclipse, so I just said, "Probably fifth." That is exactly where he placed. Prior to Philadelphia, Eclipse had showed little to no interest in females. With two exceptions - he was in love with me and a Burmese gal named Punkin. His first litter was Tonkinese. They were darling pets. His first Siamese mate was Tricia. They produced GRC Rogers Hts. Funny Girl and GRC Rogers Hts. My Name is Barbra. 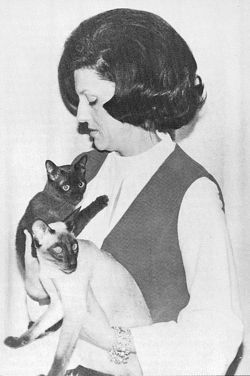 Betty Crotzer, then a relatively new Siamese breeder, asked to breed to him and I agreed with the stipulation that I was to receive the two best females. She agreed and sent her two lovely sealpoint females, Kemah and Medina, for breeding. Medina produced GRC Sin-Chiang's Kali of Mar-Ray and GRC Sin-Chiang's Riikola. Kali went on to be the number two CFA cat in 1974 and Riikola was number 15. Kemah produced GRP Sin-Chiang Ichi-Ni who was a national winner in a later year. Another Eclipse daughter, GRC Sin-Chiang Blu Velvet of De Vegas was CFA 14th Best Cat, 1976. Eclipse was retired after the 1971-72 show season and was only shown one more time at the age of 3 ½ years, and then in a show with Kali and Riikola who were both champions. I took him out that one time to quiet a rather vocal detractor. Eclipse rose to the occasion by being Best Siamese across the board and Best Cat in one ring. The girls both received many grand champion points and, I believe, Kali granded at that show. 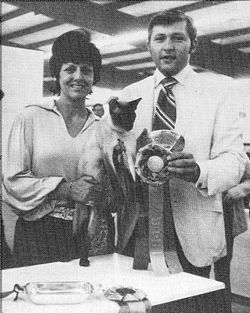 Eclipse went on to sire a record number of CFA Grand Champion Siamese. His D.M. 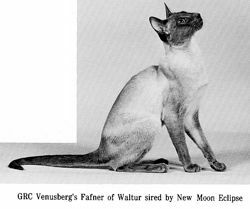 was recently confirmed with 36 Siamese Grand Champion offspring and that is presently the record high for any breed (As of October 1986). 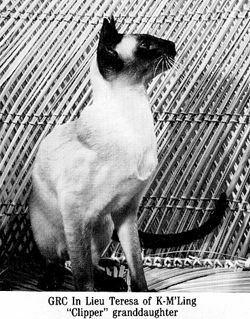 Eclipse was never closed and stands behind many wonderful Colorpoints and Orientals in addition to his Siamese progeny. He was sired by a fine old chocolatepoint male, CH Elo-Yse's Hi-Noon of Li-Gon, and his dam was a bluepoint, CH New Moon Nina. Noon was 10 years old when Eclipse was born. 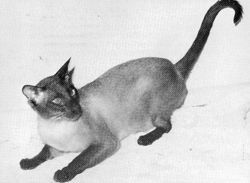 Eclipse threw Siamese grands in all four colors. Rainbow litters were not uncommon. Betty Crotzer took Eclipse to live with her when I went through a divorce and moved to California in 1974. Betty and Eclipse developed a love affair to equal or better his and mine. Eclipse never really lived with me again. Betty had a large cattery, but Eclipse had run of the house. He never sprayed, never lost his beautiful coat and color, or even more important, his beautiful disposition. Betty Crotzer deserves a great deal of credit for his promotion. 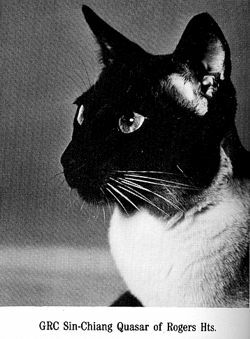 Eclipse was last honored by having the Tejas Siamese Cat Fanciers 1980 show dedicated to him. He was a King among cats and people. Eclipse died in 1980, and I believe a part of Betty and me died with him. There will never be another Eclipse, but I know I was blessed to have shared a part of my life with him. Nat'L. GRC New Moon Eclipse of Rogers Hts., D.M. Sin-Chiang Quasar of Rogers Hts. New Moon Eclipse "The Old Man"